The perfume market has been flooded with so many "niche" and "independent" lines over the past five years that I sometimes like to look back at my collection and remember the fragrance houses that really helped me to develop my taste for non-mainstream scents in the first place. Some of them, like Diptyque, L'Artisan Parfumeur and Annick Goutal, were already well-established and (relatively) widely available, while others, like Lorenzo Villoresi, Demeter (back in the 90s!) and Aroma M were smaller and more specialized. My favorite fragrance from Aroma M, ever since I first learned about the line in 2006, is the quirky-sweet Geisha Violet. I'm also fond of Amber Rouge, but I hadn't tried any others in a while, so I recently ordered some samples (while purchasing a bottle of Camellia Face Oil!) and revisited some of the other Geisha "colors." Blue and Blanche, in particular, seem well-suited for summer wear, and I've been trying them this week. Aroma M takes much of its inspiration from Japanese culture, and the description for Geisha Blanche notes that "the color white symbolizes cool elegance in any culture. In Japan a geisha's white collar carefully reveals the most sensual party of the body: the neck. White is also the color associated with her face powder and the color chosen for the spring Wedding Kimono." 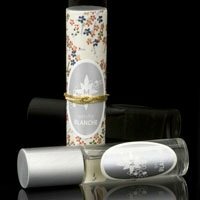 Blanche is a blend of white flowers and fruit, with notes of lychee, jasmine, hyacinth and ylang ylang. Blanche does feel cool and soft and feminine. It has more fruit than I expected: the lychee note reminds me a bit of blood orange, and it lasts through most of the fragrance's development. The white floral notes are smoothly interlaced and difficult to identify as specific flowers: the blend feels silky and just a touch soapy-clean, and there's something powdery in there that reminds me of lilies, but otherwise it's difficult to pick apart. I think of Blanche as a soft-focus fragrance, sort of gauzy and back-lit. It's simpler than some of the other Geishas, but it's very pretty. Geisha Blue is another cool-feeling fragrance that promises "calm quietude" and "tranquility." It has notes of blue chamomile, green tea, leafy greens, jasmine and honey; it's a harmonious and quietly surprising arrangement. I don't usually warm to green tea fragrances, but this one as enough herbal, floral and sweet notes to keep me interested. And, once again, the fragrance's elements are very closely combined: Blue is hard to categorize. It feels somewhat fresh (due to the brisk green leaf and tea notes), somewhat sensual (thanks to the jasmine), and a touch sweet (from the honey), and these facets all overlap and shift as the fragrance develops. One day I caught more green tea; another time, I noticed the fruity-balsamic chamomile heart of the composition; on a third try, it felt briefly like an ambery floral. After several wearings, Blue is turning out to be one of my favorite Geisha scents from Aroma M. It's unusual, but in a reserved way, and it's quite versatile: I've worn it to the office, to the movies, and on a trip to the farmers market. It's light enough for a hot summer day, but since it has something garden-like about it, I can also imagine enjoying it as an "escapist" fragrance in the winter. All the Geisha perfumes are packaged in roll-on dispensers (Aroma M was well ahead of that trend! ), and their oil-based formulation means that that they stay close to the skin, linger there, and release their scent at unexpected moments when the skin warms up. Aroma M Geisha Blanche and Blue are available as .25 oz. ($55) perfume oils. For purchasing information, see the listing for Aroma M under Perfume Houses. Both, especially Blue, sound lovely! Merlin, it’s funny, because I remember liking Blue when I tried it ages ago, and I know I even gave Blue as a gift to a friend a while back, but somehow it really clicked with me this time around! These sound interesting. I’ve not sampled this line, and as we are heading into winter here in the Southern Hemisphere, maybe I need to try one of the other colours…. Hi, Lizzie, there are a few Geishas that are perfect for cold weather, too — Rouge, Amber Rouge, Noire, and Marron. Eliza, it’s a niche classic! !